It looks like natural grass, but the turf manufactured by Global Syn-Turf has been the setting of many milestones of an innovative cooling technology that became to be the part of our landscape. Research and testing have shown that a KoolMax synthetic grass system can keep the surface temperature significantly below average. It's not a secret that all engineered surfaces like concrete, asphalt, and plastics, heat up when sitting in direct sunlight for long periods of time - even in mild weather. Synthetic turf is not an exception. Unlike biological substances including our own bodies release heat through radiative cooling to the air, thermoplastic compounds don't have a built-in cooling system. We all know that heat can be transported in multiple ways. For conductive heat transfer, it has been long recognized that, although heat dissipated from a heat source will ultimately reach ambient heat, paths may be different depending on the shape of an object and how the object is cooled. During the day, the sunlight heats the earth as solar radiation excited particles of objects increasing its kinetic energy. The surface texturing and the area of the surface affect heat-transfer performance. For example, organisms living in extremely cold environments have a smaller surface area to volume ratios. Organisms that live in tropical zones have a larger surface area which means they have a mechanism to help disperse body heat. 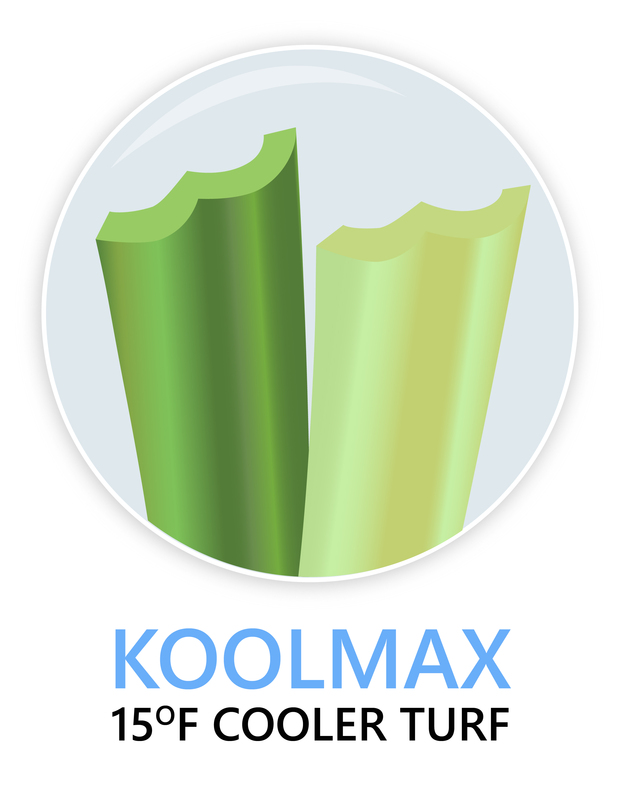 KoolMax turf blades have significantly larger, multi-faceted surface area than regular, flat turf blades, providing extra cooling benefits. The sun blasts more than a billion tons of matter out into space at millions of kilometers per hour. The sun is a huge ball of gases, mainly hydrogen. Every day, it is converted into helium through millions of chemical reactions. The by-product of these reactions is heat. The sun emits many forms of electromagnetic radiation. 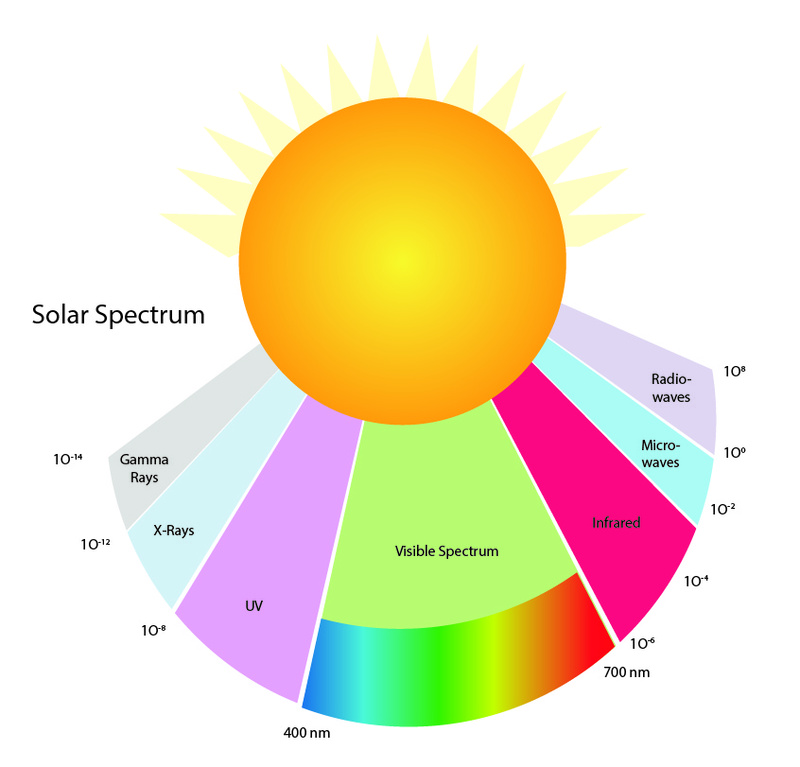 About 43 percent of the total radiant energy emitted from the sun is in the visible parts of the spectrum. The bulk of the remainder lies in the near-infrared (49 percent) and ultraviolet section (7 percent). Less than 1 percent of solar radiation is emitted as x-rays, gamma waves, and radio waves. According to the University Corporation for Atmospheric Research, when Sun's energy reaches Earth, about 20% of it is reflected by clouds, 5% - by an atmosphere, 5% - by Earth's surface. In total, 30% is lost to space by reflection and scattering. 50% of directs and diffused radiation is absorbed by land and sea. 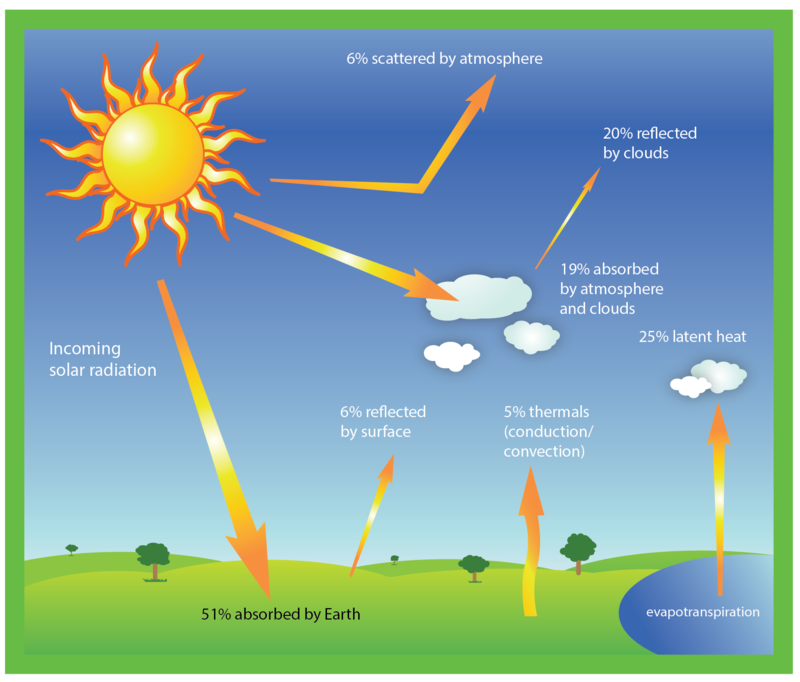 The term albedo describes the percentage of solar radiation reflected back into spaces by an object. A perfectly black object has an albedo of 0, which means it absorbs all radiation. A perfectly white surface's albedo is 1.0; no radiation is absorbed. For example, snow, ice, clouds have 0.7-0.9 albedo and reflect more energy than they absorb. Tundra and ocean albedo is from 0.1 to 0.4. They absorb more energy than they reflect. Why Sunlight Heats the Object? Sunlight heats a material because the infrared, or long wavelength portion on Sun's radiation excited electrons in the atoms and set the molecules into motion. Some materials' atomic vibrational energy is roughly equal to the electronic energy (photons) absorbed from the Sun; a quantum transition causes the whole atoms to move. Those atoms who jump into vibrational excitation start colliding into neighboring atoms, dissipating their vibrational energy throughout the entire object, making it hot. Heat can be transferred from one object to another in four ways: conduction, convection, advection, and radiation. Heat conduction is the flow of internal energy from a region of higher temperature to one of lower temperature by the interaction of the adjacent particles (atoms, molecules, electrons, ions, etc.) in the intervening space. The electrons can leave their atoms and move as free as electrons. The left-behind atoms become charged. The hotter the object, the more kinetic (motion) energy the ions vibrations have. Thus, on the atomic level, the kinetic energy is often referred to as heat energy. Temperature is the measure of the average speed of atoms and molecules. When a material is heated, these particles of matter move faster than in its cooler state. At a temperature of -273.15° Celsius all atomic motion stops. Convection involves the transfer of heat energy by means of vertical mass motions through a medium. The medium must be a gas or a liquid. It's a transfer of internal energy into or out of an object by the physical movement of a surrounding fluid that transfers the internal energy with its mass. In convection, molecules carry the energy through liquid or gas. Their particles move and take the place of particles with less heat energy, which transfers heat energy from hot to cooler places. Since the particles of heated liquids and gases move faster, the gap between them widens, they take up more space, which makes the substance expand. While convection transfers heat in the vertical plane, advection involves the transfer of heat energy by means of horizontal mass motions through a medium. It powered by the outside force, for example, wind or currents, to displace the particles of the medium. As the particles move horizontally into systems with uneven temperatures, heat is transferred. Radiation is the emission of energy from an object in the form of electromagnetic waves and photons. All objects take in and give out thermal, or infrared radiation. In radiation, not particles are involved. This is why the Sun emits heat although it's 150 million kilometers away from the Earth. When the heat waves hit the object of lower temperature, they speed up its molecules. The transfer of energy from the sun across empty space is accomplished primarily by radiation. The heat released from the sun's chemical reactions radiates into space. The heat energy usually reaches earth in the form of light. 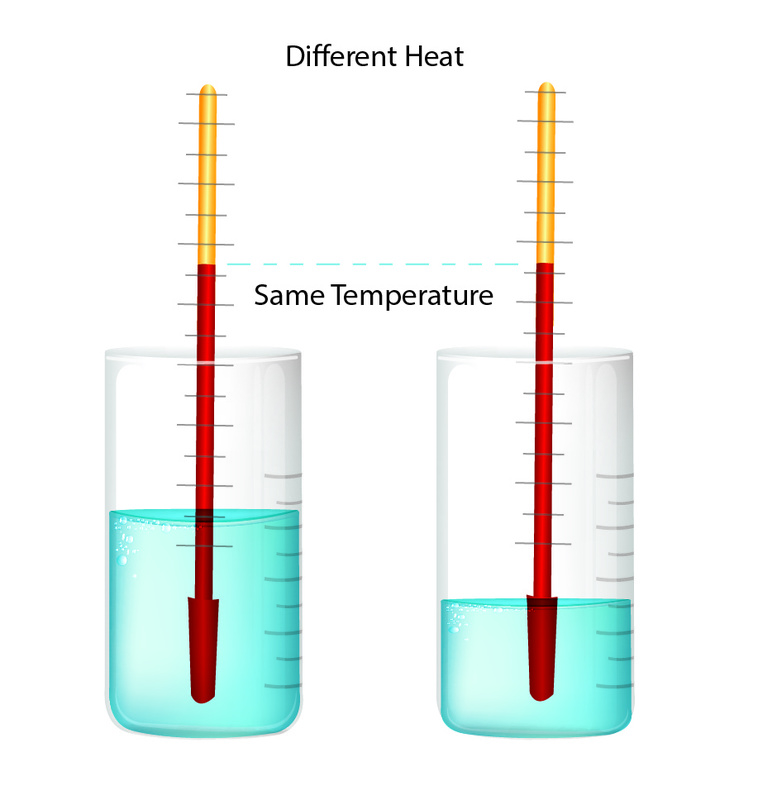 Heat and temperature describe different measurements. Heat is the measure of molecular energy. The total amount of heat depends upon the number of molecules, dictated by the mass of the object. Heat is sometimes called a process quantity because it's defined in the context of a process by which energy is transferred. The temperature measured the average kinetic energy of the atoms or molecules. The molecules in each object are in constant motion; every time they collide, kinetic energy is transferred. The thermal energy flows from the hotter system to the cooler until the two objects reach the thermal equilibrium. Unless the system doesn't undergo a phase change, the heat transfer changes the average kinetic energy of the molecules, which causes the temperature change. KoolMax technology is based on the kinetic theory of matter and the principle of conduction. 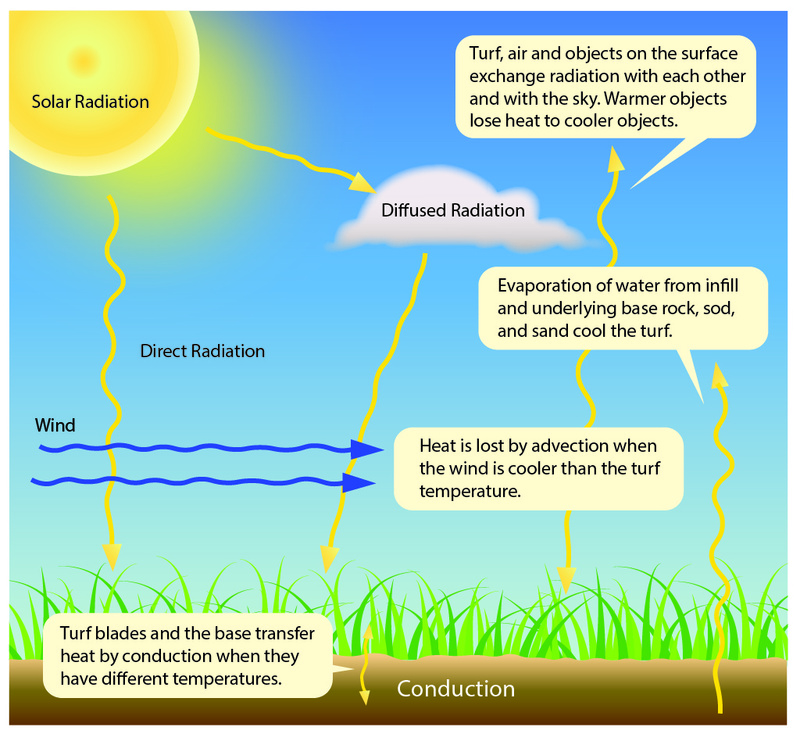 When the electromagnetic energy emitted from the sun hits the turf surface, it speeds up the molecules of the area exposed to the sunlight. If a blade is flat, the kinetic energy of the entire surface is immediately affected. The KoolMax or W-shaped blades have four facets instead of one. Thus, the energy transmission slows down as it must pass energy from the initially heated facet to the next one by one. The continuously colliding and jiggling particles start hitting the neighboring molecules to reach the thermal equilibrium in each blade. The increased conduction time allows less thermal buildup during the hotter part of a clear day when most needed.